Барааны дугаар 9780199234899. Categories: Dictionaries, OXFORD. The new edition of this established bestseller dispels modern financial and management jargon, defining entries in a clear, concise, and accessible manner. It contains US business terms, general management concepts (e.g. competence, knowledge management), named theories (e.g. Tannenbaum and Schmidt, Blake and Mouton) as well as expanded coverage of the contemporary theory of the firm and human resources. New terms are included from the fast-moving areas of current affairs (e.g. MiFID), Internet business and information technology and there is full coverage of the new Companies Act. With recommended web links for many entries, accessible and kept up to date via the Dictionary of Business and Management companion website, this edition is more informative than ever. This A-Z reference work is essential for business students, teachers and professionals, and useful for anyone needing a guide to business terminology. 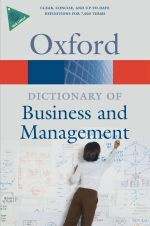 Readership : Students on business and management courses at all levels; business professionals including lawyers, bankers, accountants, advertising agents, and insurance brokers; the general reader looking for clarification of everyday business terms (encountered, for example, in house-buying, tax returns, or share investment).